May 5 and 6: GRAD FEST - Pick up your cap, gown and Commencement tickets. Fall 2008 and Spring 2009 Graduates: The Office of Alumni Relations is your home for Commencement 2009! Please watch your kentlaw.edu email for announcements and updates throughout the year. For questions, please email any questions to commencement@kentlaw.edu or visit the Commencement Portal online. GRAD FEST: Pick up Your Cap & Gown and Tickets! 2009 graduates, join us at the GRAD FEST to receive your graduation gift, your 7 complimentary commencement tickets and your cap and gown. Please be sure to bring a picture ID! Those wishing to purchase extra tickets may do so on a first-come, first-serve basis for $15/ticket. Graduates and children under 2 do not need a ticket. Please note: You MUST pick up your commencement materials during one of these two days. If you will be out of town, please email commencement@kentlaw.edu. This form is required if you will participate in the commencement ceremony. It must be completed before you can receive your commencement tickets. Caps and Gowns are complimentary from the Office of Alumni Relations. However, forms submitted beginning April 7 at Midnight will be charged a $20 late fee. Beginning Monday, May 4 at Midnight, an additional $15 rush fee will apply. This form is mandatory in order to graduate. Those students participating in the commencement ceremony will not receive their commencement tickets until this form has been completed. This form was due by Friday, April 17. It should be completed ASAP. All information is strictly confidential. 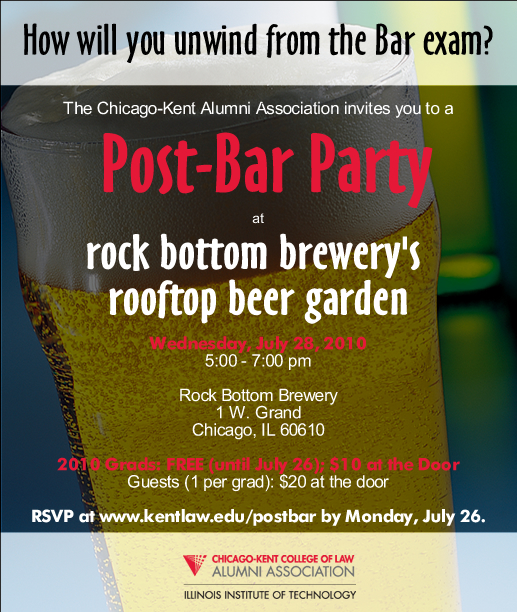 All members of the 2009 Graduating Class (including Fall 2008 graduates) are invited to the Post-Bar Party, regardless of when you take the Bar exam! Because of space restrictions on the rooftop, graduates are allowed to bring only one guest per person. You must accompany your guest. A photo ID will be required for admittance. Facebook Users: Let your friends know you're attending by joining the event on facebook! Due ASAP. Beginning Monday, May 4, a $15 rush fee will be added. This form is required to participate in commencement exercises. Cap and gown rental is complimentary; but, forms submitted beginning April 7 at Midnight will be charged a late fee. Beginning Monday, May 4 at Midnight, an additional $15 rush fee will apply. This form is required for ALL 2009 graduates. Your 7 complimentary commencement tickets and cap and gown will be distributed in the lobby of the law school building from 1:00 to 7:00 pm. You MUST pick up your commencement materials during one of these two days. *Those wishing to purchase extra tickets may do so on a first-come, first-serve basis for $15/ticket. Graduates and children under 2 do not need a ticket. The 2009 Commencement Ceremony takes place at 3:00 pm at the Arie Crown Theater, McCormick Place. Graduates should arrive by 1:45. A champagne reception follows immediately outside the Theater. Congrats 2009! You have met the Class of 1983 Participation Challenge! Not only did you break a class gift record of 101 people in 2006, but you earned $5,000 from the Class of 1983 towards the Reading Room Lighting Renovation. Give yourself a hand!! The Class Gift Drive isn't over! If you haven't participated you can do so until commencement, May 17. A check presentation will be made to Dean Krent in the robing room prior to the Commencement Ceremony. Each donor will be presented a special Chicago-Kent zipper pull in the Robing Room to wear at graduation. To make a gift by check or cash, please download the pdf form here. (right click and save as). All donations are tax deductible to the extent allowed by law. If there are any errors, please email Tanya Pietrkowski or call her 312-906-5243. In an effort to help you connect with a strong network of Chicago-Kent alumni, the Office of Alumni Relations and Office of Career Services are happy to announce a new Alumni Career Advisor Network. Alumni from around the world are available to discuss issues such as practice trends, legal markets in specific geographic areas, and other career-related topics. This is an excellent opportunity to start building your personal network with Chicago-Kent alumni! In the Constituent ID field, enter your Banner CWID. If you are a JD student your Class Year will be three characters. The first letter for all class years will be L. The second letter is your division. The third is your year number. Examples: A 2nd year night student’s class year is LN2. A 1st year day student’s class year is LD1. During your first time login you will create a username and password. Afterwards, you may log in directly at www.alumni.kentlaw.edu/advisorsearch using the username and password you created. If you need assistance with your first time login, please email kentcso@kentlaw.edu. We invite all students, faculty, alumni, and staff to join the official Chicago-Kent group on the networking site, LinkedIn. If you have a LinkedIn account, please click here to request membership. Questions? Contact alums@kentlaw.edu.